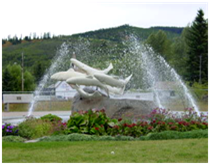 The Steelhead Fountain was sculpted in 1992 by Frank Eberman and placed in Steelhead Park. This sculpture depicts the steelhead striking up the Skeena River. They are “coming home to Houston” to spawn. Houston is known as the world’s Steelhead fishing capital.